NPR wrote a story about the additional 9+ million people who are currently underemployed. That’d be me. As a contract writer who didn’t pay into unemployment benefits, my “situation” has not been counted into the government’s numbers of those looking for work. I count, dammit. Admittedly “Gadora Wilder“ first came alive as a result of the “restructuring” of my last good gig, and now I find myself grateful. 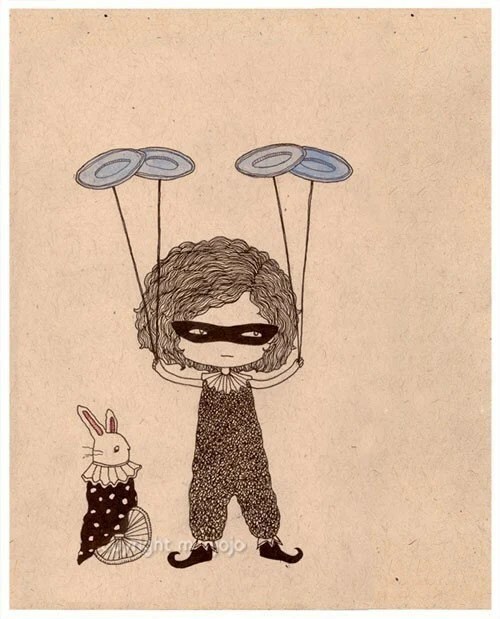 I am juggling. Looking for work. Sometimes I cry. I celebrate little victories. And work to market myself. Still without a full-time gig, opportunities are presenting themselves and Gadora is poised to take full, and appreciated, advantage of them all. 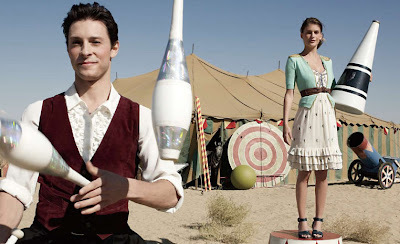 After organizing a very immediate To-Do list last night, Gadora googled “Circus 2010” and Anthropologie’s latest catalog queued up. I’m juggling schedules, projects, friends, skating and The Squeeze. I’m quite inspired by it all. 2010 I’VE GOT YOUR NUMBER. And yes, you will be mine. An admission: instead of the ultra chic Anthro girl—clad in dainty dresses and über chic shoes—Gadora often feels a lil like this frizzy-headed girl masquerading in elf slippers (yes, I do own a felted pair with an up-turned toe). Thinking about the circus that has been my last 15 months looking for work, and while searching for a suitable and sustainable new direction, Gadora fancied all the ways one might bring the circus home. The Old Hickory Tannery settee is magically delicious. Reminds me of something The Sprucettes might do, a brilliant way to re-appropriate an otherwise vintage-looking style. Smart. And Gadora hearts it. 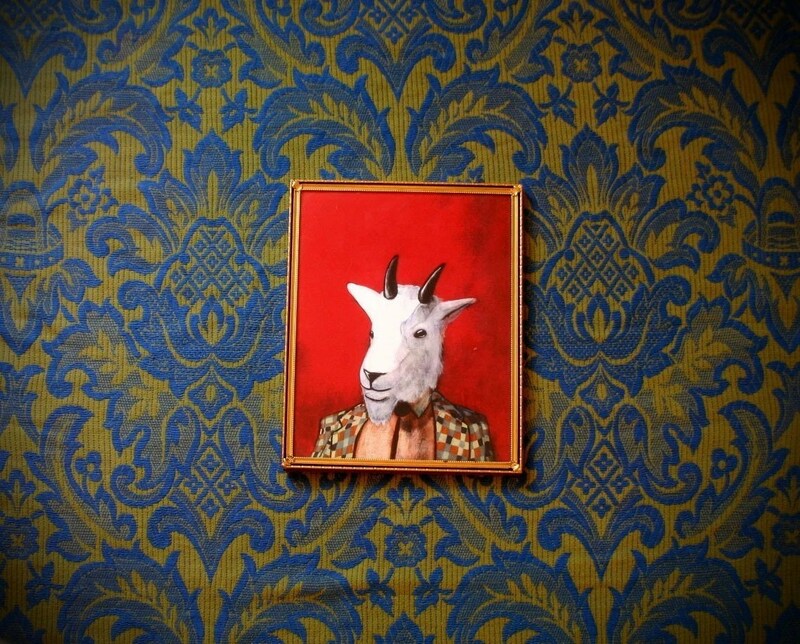 While one might not expect to see a Goat in a Suit, the bright colors speak Circus. The original painting from Portland’s CaptainCat is of Isaac Asimov, the Russian-born writer known for science fiction. Only proper to include Deon Roe’s “Financial Storm” in the mix. Though not entirely circus-themed, the interior design student-turned-mosaic artist makes a statement with her “heroine juggling the five major areas of our financial crisis: bank bailouts, automobile industry, foreclosures, insurance, and unemployment.” I hear you Sister. Under my own big-top, there’d be space for sensational lighting… enter Gallery840’s Murano Venetian-style ruby red chandelier. A Circus serves up popcorn. And while Generation’s Nostalgia doesn’t spit out PoppyCock (thanks Jess and Tom for my can, it’s LONG GONE! ), a popcorn popper is a requirement for any circus experience. ConeyIsland ~ because Gadora LOVED her time with her girls on that dirty little beach. Britney Spear’s 1 oz. of CIRCUS fantasy perfume ~ I couldn’t resist mentioning BS’s bs circus perfume, nor a tie-in quote from my favorite singer/song-writer OF ALL TIME Martin Sexton who sings, “1 oz. of action beats a ton of words…” I shall leave you with this… here comes the sun. Hallelujah! Posted on February 11, 2010 February 14, 2010 by gadorawilderPosted in InspirationTagged Anthropologie, Circus, Side-table, table lamp, vintage. Previous Previous post: Kitties Comet and Daphne.